The Internet of Things is a label that the computer industry, the media, and manufacturers have created to describe small devices that live on a network and provide a specific feature. What is micro-segmentation? This is a relatively new concept in security and is what I believe will be required in order to combat the threats we now face on the Internet and in our Enterprises. The problem with Perimeter-style security is that you've made a fundamental assumption that things on the inside are "good" and things on the outside are "bad". This means that if something does get through the perimeter that all of a sudden it will be trusted to move around the inside network. That's a really bad assumption. The more you poke holes in the firewall, the worse the perimeter defense looks. Every green arrow is an allowed connection into a network host, but then that host can connect to everything else inside. Micro-segementation is an architecture that distributes the "perimeter" to only encapsulate, and protect, specific items (applications, services, servers, departments, etc.). Building this type of architecture will allow you to better protect each individual asset because you're only going to "poke holes" for the specific services required to run that asset. I saw a great presentation on this from Edward Amoroso (@hashtag_cyber), which you can also read in this article: Remove the balloon from the dartboard. I believe that the larger threat globally is that our personal networks are not being adequately protected and yet they are growing at a much faster pace than Enterprise networks, with far less ability to secure them. We are all buying "Smart Things" at Home Depot and Lowe's and then bringing them home and plugging them into our personal networks. The same networks into which we plug our work laptops. For not a lot more money than a traditional, high-end, wireless network, you can instead build an architecture that protects yourself, but more importantly the World, from your Internet of Things. To be honest, we aren't really going to be performing micro-segmentation. If we were going to do that, we'd have to take each of our IoT "hubs" (SmartThings, Philips Hue, Sonos, etc.) and segment each off to its own subnet (own network) with its own firewall rules. Micro-segmentation would be a great idea and would enhance the security of your network, but there are limitations to most prosumer (we're talking a level above standard consumer networks you buy at Best Buy or Staples, but a notch lower than most Enterprises) networking equipment that doesn't make it practical. Instead, we're going to segment our IoT devices into their own subnet, and SSID, to keep them segregated from our internal network. So, at $1,263.74 for my previous setup, this is actually cheaper and I'll be selling all of the old components, other than the pfSense firewall, so I'll make quite a bit back. We'll be doing the segmentation with a combination of different SSIDs mapped to different VLANs being routed on different Subnets. The beautiful thing about the Ubiquiti equipment is that the Ubiquiti Access Point (UAP) supports up to 4 different SSIDs, the switching equipment supports multiple VLANS, and the USG can route multiple IP subnets and provide DHCP service to each of them. First, let me address the use of the Cloud Key. All of the equipment I'm discussing here is in Ubiquiti's UniFi line of networking equipment. All of these components are meant to be configured from a central management interface. You can still configure the equipment via console cables, or by SSHing into the system and using the Command Line Interface (CLI), but that's not the intent. The Cloud Key is an all-in-one device that provides the management interface for all of your Ubiquiti UniFi equipment. It is powered via Power-over-Ethernet (PoE) from the US-16 switch and makes the entire system turn-key. 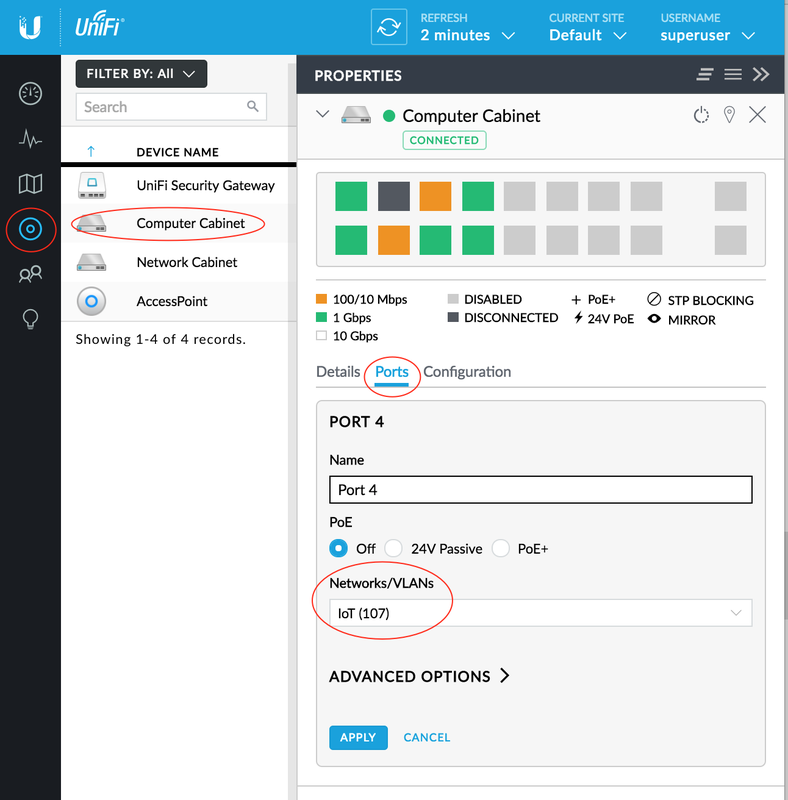 However, you can also run the Ubiquiti UniFi Controller for Macintosh, Windows, or Linux (you can even run it in The Cloud). 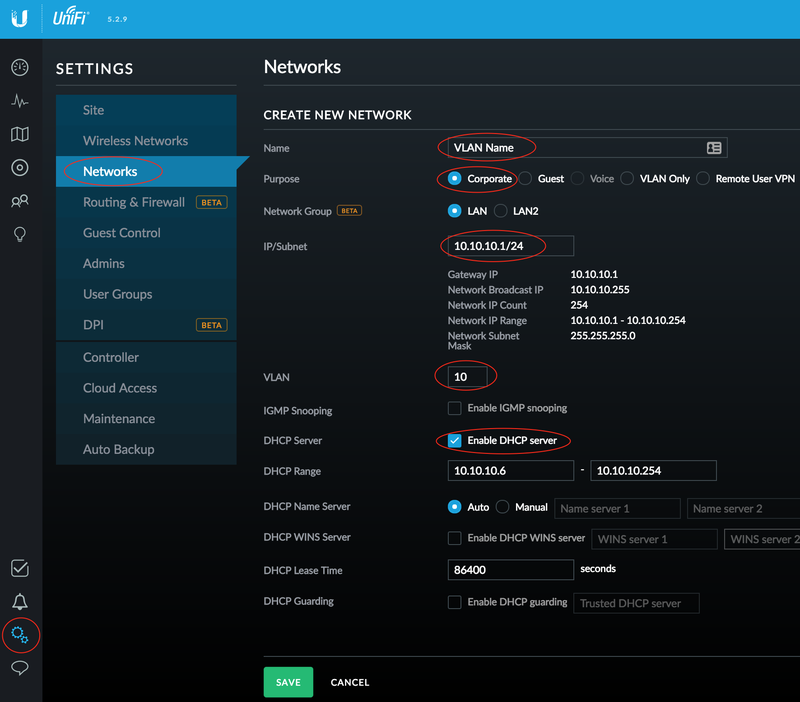 This is a free download from Ubiquiti, but also means that you need to be able to have it running somewhere whenever you want to make configuration changes. I opted to have a dedicated piece of hardware handling these functions as part of the overall configuration. The initial setup of the Ubiquiti equipment was straightforward, with the exception of the USG. The two US-16s were drop-in replacements for the Cisco switches and didn't require any initial configuration to start working. I then plugged the Cloud Key and the UAP into the first US-16 switch and they too just powered up via PoE from the switch. My internal network runs on an RFC-1918 subnet that is NOT 192.168.1.0/24. The DHCP service is being provided by my pfSense fireall and for the purposes of this upgrade I wanted to keep the pfSense firewall online during the migration, to minimize downtime. Unfortunately, the USG comes pre-configured to hand out 192.168.1.0/24 on the inside interface. In order to "Adopt" the USG into the Cloud Key, the Cloud Key must be able to talk to it on the same subnet. That means the Cloud Key must be on the 192.168.1.0/24 network, which was a real hassle in my configuration. I eventually had to bite the bullet and take the pfSense firewall offline, put the USG in, let everything pull 192.168.1.0/24 addresses, and then "Adopt" the USG into the configuration, before I could re-configure the USG to hand out the internal network I wanted to use...it burned several hours of my time, so hopefully you'll learn from reading this that you must put the USG into the network and just let it be the DHCP server and hand out the network it was configured to use, it'll add some time, but fighting it makes it worse. For the purposes of this discussion you should only need to create one additional network (for your IoT devices). Click Save when you're done with the configuration. You now have a VLAN in which your IoT devices can live. 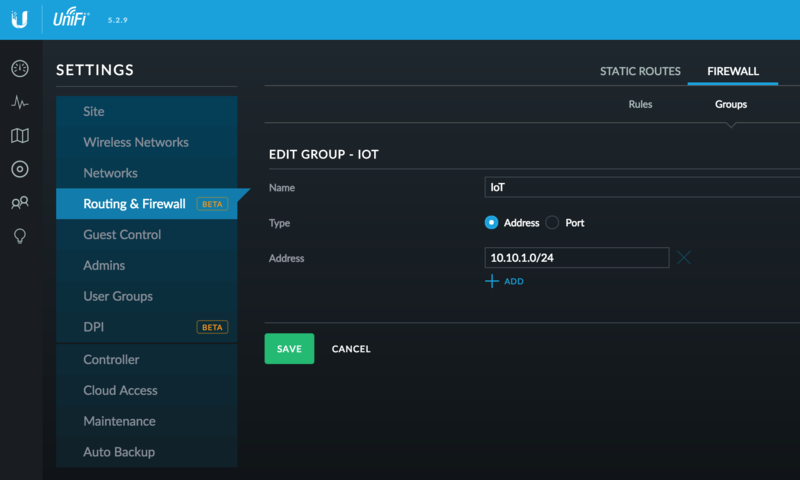 You now have your IoT devices on a separate network from your default LAN (which was the original network that the USG built for you, and to which you probably configured your initial SSID). 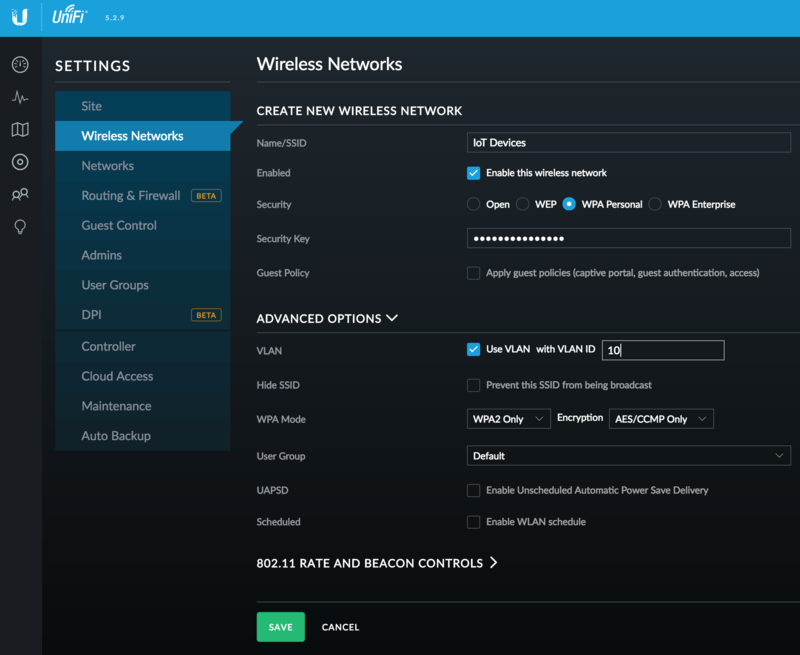 Now when you add an IoT device to your network, configure it with your IoT SSID to provide segmentation. 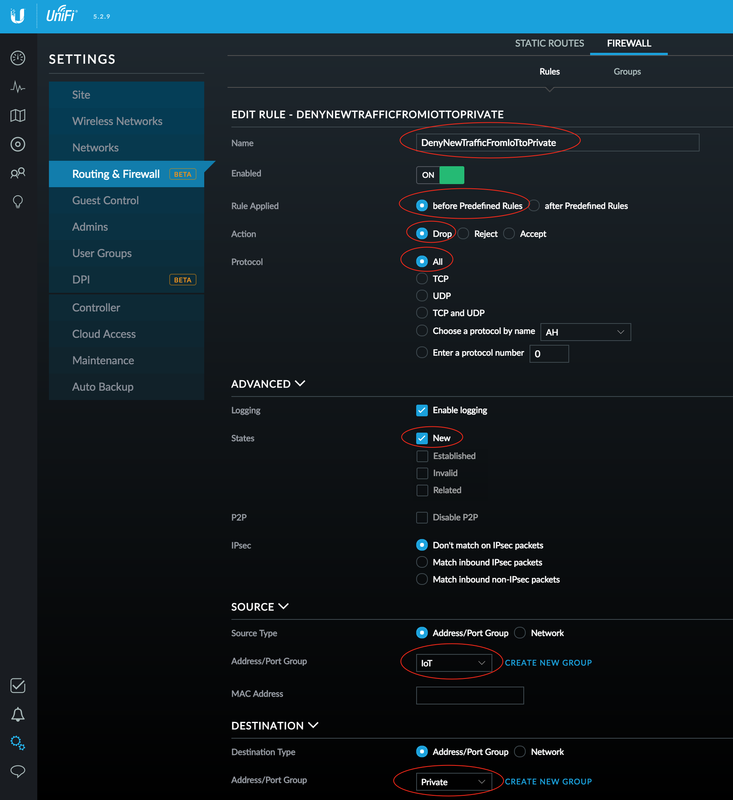 Additionally, you should also take any physically wired devices (SmartThings Hub, Hue Bridge, Sonos Bridge) and configure the ports in the switch to only speak on your IoT VLAN. The network configuration is now complete. You should be able to have both wired and wireless clients join the IoT network and they should work normally. However, there is an additional security step you should take to complete the micro-segmentation of the IoT network. The USG will automatically route all networks of type Corporate between each other (in fact, it creates uneditable/undeletable firewall rules to enable this behavior). You could have made your IoT network of type Guest which would allow you to automatically restrict its access to your Corporate networks, but in my case I set up my Guest network to have a Captive Portal. On the USG, all Guest networks have to be treated the same, so if one has a Captive Portal they all will and my IoT devices cannot authenticate via the web page, so they would be denied access. If, like me, you want to have a real Guest network, then you're going to have to firewall the IoT network from your Private network. 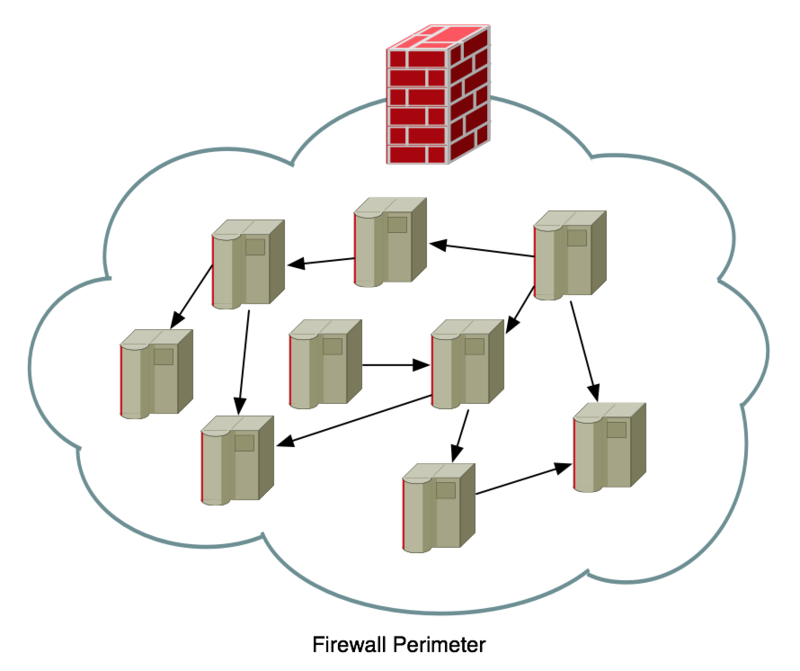 Once you have created at least two groups, Private and IoT, you can configure a Firewall rule to secure them from each other. Before I jump into the configuration it will be important to understand something about firewall connection states. 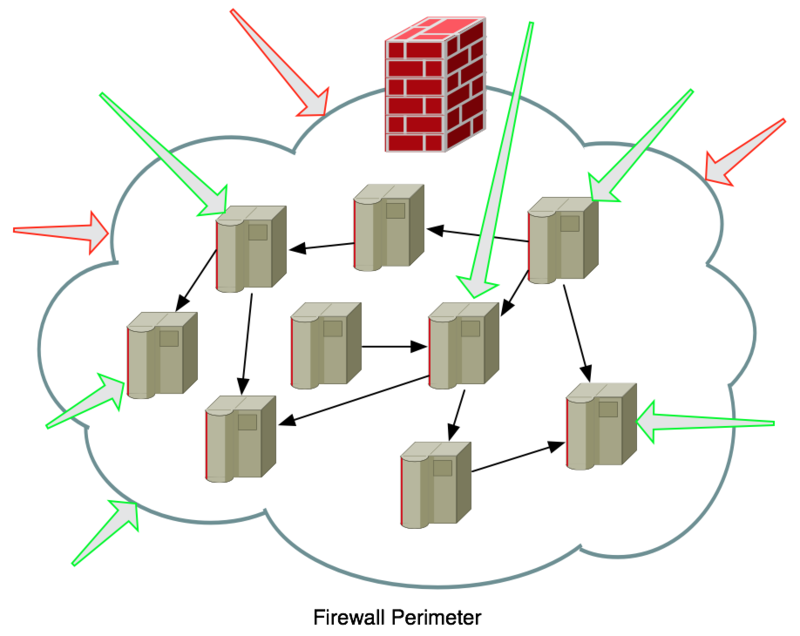 At the Firewall we want to deny traffic from the Internet that is attempting to make a new connection into our network (Unsolicited), but we want to allow traffic from the Internet that is in Response to a connection that was Requested from inside the network (Established). You want to block bad guys from coming in, but you also want to see the web page from Amazon that you asked your web browser to open up when you typed in https://www.amazon.com/. Once you click Save it will take approximately 60 seconds for the rule to be applied in your Firewall. If you only selected New under States then you should be able to still reach things in the IoT network from your Private network (e.g. ping them), but the reverse will not be true. You can test your connectivity by placing an iPad or iPhone on the IoT network, then from the iOS device ping something on the Private network, it should be blocked, but when you ping the iOS device itself from the Private network, you should get a response. If you desire complete segregation of the two networks, edit your Firewall Rule and check the other three states (Established, Invalid, Related) and save it. You will no longer be able to access systems across internal networks in either direction. When testing you will ALWAYS be able to ping the default gateway (USG), even from the wrong network, since it is using sub-interfaces and you're really just pinging the same interface, so be sure to test actual hosts inside your various networks. You now have a MUCH more secure network than when you started and you've successfully segmented your IoT devices from the rest of your network.